The Sharp Convection Grill Microwave R-820JS is a low wattage appliance that can adequately grill burgers and reheat your leftover food. Plus, it is an affordable model, retailed at $200 to $299. Yet, it surely has a number of flaws – namely, its obviously malfunctioning presets. All in all, it is impossible to say that this microwave is a total failure. Like most of these kitchen appliances, it has a fifty-fifty success rate. However, there is a huge problem with microwave presets, as none of them works as it is supposed to. Certainly, Sharp R-820JS can grill and reheat the food quite fine. Yet, given the malfunctioning presets, you will have to figure out the actual regimes all by yourself. Though not really a drastic flaw, it is still quite annoying. After all, why bother paying extra money for the features that do not work? 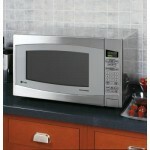 Sharp R-820JS has a classic microwave design without any extraordinary features. The exterior is designed in silver metal, while the interior is made of stainless steel. Surely, if both exterior and interior were designed in stainless steel, Sharp microwave would look richer and more elegant. Metal body really simplifies the model and makes it look cheap. Yet, the size of the appliance is an undeniable advantage. If you are looking for unobtrusive, compact solutions for your kitchen interior, Sharp R-820JS will be perfect for you. 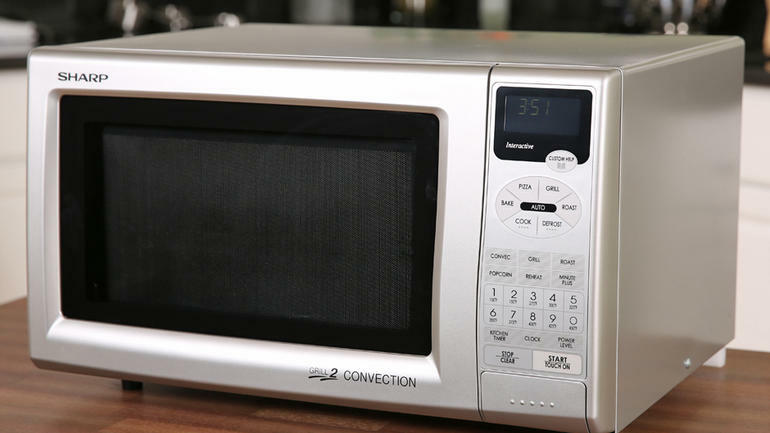 So far, this is one of the smallest microwave models in the market, with only 0.9 cubic feet interior, and 12.75 inches carousel. If you are not frustrated by the minimalistic look and toyish impression it conveys, this might be a wise choice for limited space kitchens. The front panel, though, is tiny – so you will not be able to read anything unless you are standing right next to the microwave. Given that Sharp R-820JS is a low-wattage device, cooking and heating will take longer than average. For example, it takes the appliance over 3 minutes to boil a cup of water, while higher-wattage models can cope with this task for slightly more than two minutes. 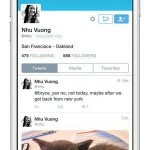 Pluses include relatively low price, unobtrusive design and a highly compact size. Minuses are slow heating /cooking speed and poor preset functionality. All in all, Sharp R-820JS is not that bad, though it could obviously be slightly sharper. It’s ok for frozen dinners and leftover reheating – but to be completely honest, there is nothing more to it.